Breeding quality rabbits for show and pets. We are a small rabbitry located in Northwest Arkansas. We care for Mini Rex, Netherland Dwarf, Holland Lop & Lionhead breeds. We started with one rabbit as a pet, and have grown to 11. Our rabbits have now become not only our pets, but a growing 4-H project. We attend local district & county shows, and some close ARBA shows. Our main focus is 4-H and shows, which enables our breeding program to remain a hobby. Most of our buns are pedigreed, and those who are not pedigreed are from pedigreed stock. We got our start when attending our first show at a local county fair in 2010, and won first place & grand champion pet. We got the show bug, and purchased more rabbits. We have yet to leave a show ribbon-less. We've attended a small number of ARBA shows, and placed first and second each time. 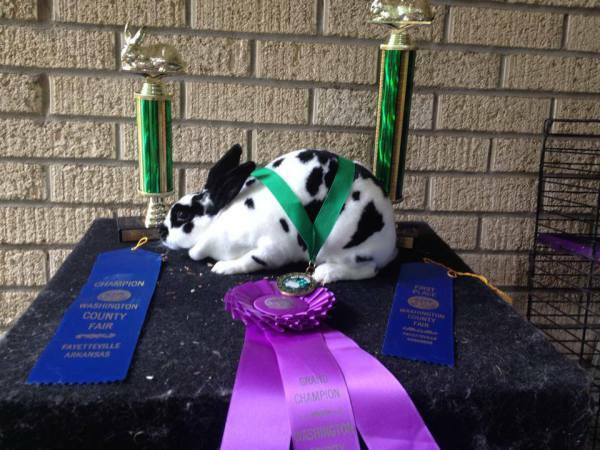 Our best award to date is the Best of Show our Broken Black Mini Rex Doe, Elsa, won at the Washington County Fair Rabbit Show in 2014. At Rabbits by Claire & Gabby, we are focused on providing quality pets, breeding stock, or show potential rabbits. With a variety of breeds and colors to choose from, we’re sure you’ll be please with the selection..
Look around our website and if you have any commentsor questions, please feel free to contact us. We hope to see you again! Since we are a hobby breeder, we want to keep our prices fair. Our prices range from $10-$35. Pet quality rabbits start at $10. The prices go up depending on pedigree, supply & demand. Ask about our 4H & FFA discounts. We like to help anyone starting out in rabbits. Not interested in purchasing just yet, or maybe you've recently purchased a rabbit & could use some help with questions you may have. Feel free to email us. We are happy to answer any questions to any fellow rabbit enthusiast, not just customers. I remember starting out with tons of questions, but limited resources for answers. Please, don't hesitate. We are here to help. The Mini Rex variety have velvety soft fur. Our Mini Rex litters have produces colors ranging from BEW, VC REW, black, otter, castor, red, and torte so far. Netherland Dwarf kits we've produced have come in Chestnut, Chinchilla, & Opal. They are gorgeous little ones! We don't have quite the variety in color, but make up for it with their sweet disposition. Holland Lops are bar far, the cutest rabbits of our herd. Our rabbits have produced torte & broken torte colors, with some smokey colors as well. Their faces are the sweetest to behold!